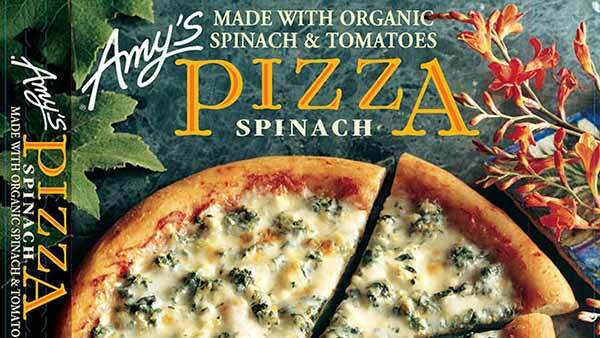 Amy's Kitchen's spinach pizza is among the products the company is recalled on March 23, 2015 because they may contain spinach contaminated with listeria. PETALLUMA, Calif. (WLS) -- Amy's Kitchen has issued a recall of frozen pizzas and meals for possibly containing spinach contaminated with listeria. Recalled products include popular Amy's products like vegetable lasagna, tofu lasagna, spinach pizza, enchilada verde meal, stuffed pasta shell bowl and many more. A full list of all recalled products, including UPC codes, lot numbers, and dates made is available here. Recalled products were distributed to stores nationwide in the U.S. and Canada. Consumers are urged to either dispose of the recalled products, or return them to the store where they were purchased for an exchange or full refund. The company issued the recall after being notified by one of their spinach suppliers that Amy's may have received organic spinach with the possible presence of Listeria monocyotgenes, which can cause serious and sometimes fatal infections. Symptoms include high fever, severe headaches, stiffness, nausea, abdominal pain and diarrhea. Listeria infection can also cause major complications in pregnant women. Amy's has not received any complaints of illness, but is recalling the products out of an abundance of caution.